The Panopticon: Am I the Walrus? When I was in second grade, my science class did an electricity experiment that went haywire while I was touching the metal end of the apparatus. I looked a smidge odd until my eyebrows grew back; yet on the whole I thought the experience of being briefly connected to a live current was pretty cool. This may help to explain why I like New York City so much. I saw it for the first time in the late 1980s, courtesy of a gracious college roommate who invited me to stay with his family in Manhattan during Spring Break. My parents, upon hearing our travel plans, were full of grim foreboding. The words filthy, noisy, crowded, and (above all) dangerous were thrown about. They didn't mean to be wet blankets, truly they didn't; but my great-grandmother got mugged on the street in Brooklyn in 1966 and after that whole place went straight to Hell. On the afternoon of the first day, I dutifully called home to reassure my mother that I hadn't been kidnapped and sold into white slavery like Mary Tyler Moore in Thoroughly Modern Millie. "Well?" said Mom, "How is it?" "I found it!" I sighed. "I finally found the place where everybody walks at the same pace I do!" Americans who are not New Yorkers are not supposed to like New York. They're allowed to like certain things about it, maybe. A good musical, the Metropolitan Museum of Art, or spotting Yoko Ono shopping at Barney's Uptown. But then they're expected to go home to a split-level house with a two-car garage and complain about the rushing, the crowds, the noise, the dirty streets, the overwhelming muchness of it all. Real Americans (as we were repeatedly reminded during the last election) are supposed to live in the suburbs and like it. Real Americans are supposed to prefer placid, empty, quiet, tidy. But who would want a placid, empty, quiet, tidy New York? Not me. That wouldn't be New York, that would be Pyongyang. You may have it. I go to New York to plug in. I love the way it wakes me up, even when it's unpleasant. Take, for insance, the smell of the subway underpass at 42nd Street. I'm not saying I savor that aroma, but you must admit it cannot be taken casually. 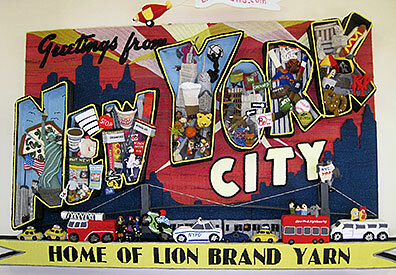 This month I went to the city to play with the good people at Lion Brand Yarn Studio on West 15th Street in the Union Square/Flatiron neighborhood. I gave a talk (and people came! and they laughed!) and I taught three classes (and people came! and we all laughed!). The Studio serves as a public face for the company and is completely adorable. 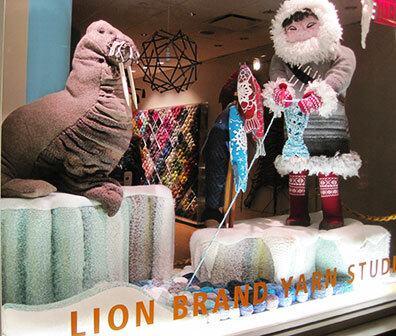 I don't care if you've never touched a skein of yarn in your life–you cannot ignore a display window that looks like this. A closer view of the walrus. They were considering naming him "Franklin." I hope they did. 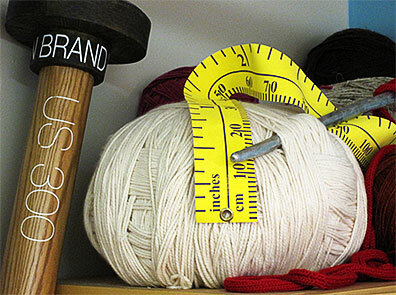 These folks go way beyond the customary yarn store mode of a-couple-baskets-of-yarn-plus-a-limp-sweater. The Studio interior is punctuated by spolia saved from previous installations, so you never know what you're going to encounter when you turn a corner. I'm afraid I had only a pocket camera of limited capacity, but here are a few snaps of what I found. In the larger upstairs classroom, spare materials for students who may have forgot something. The needles are size US 300. Not sure about the metric conversion. Wouldn't want to take them through airport security. This guy sits in the window of the smaller classroom, looking out to West 15th. Hug it? Knit it? Hug it? Knit it? 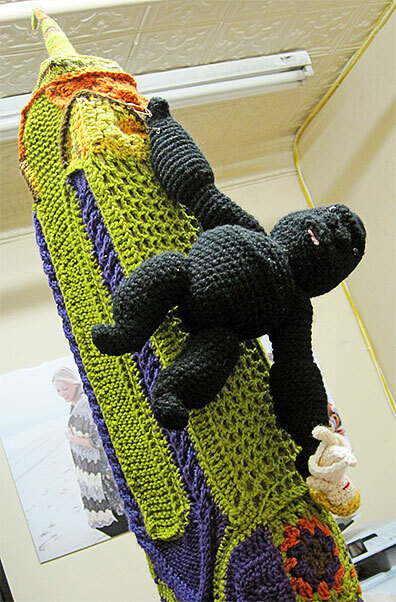 On the way into the company owner's office, there's a crocheted Empire State Building complete with a couple of sightseeing tourists. 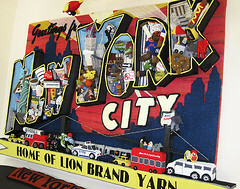 Inside the office, there's a vintage-style postcard (eight feet wide) celebrating the city's icons. 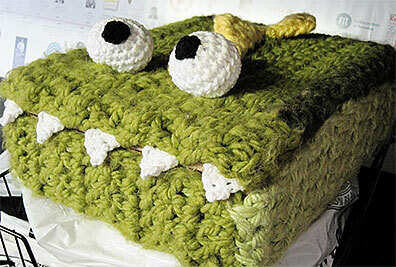 is that the letters are three-dimensional and contain knitted and crocheted versions of (partial list!) Patience and Fortitude, the NYC Public Library lions; the giant Cup o' Noodles from Times Square; the Statue of Liberty; a Yankees cap; the Flatiron, Empire State, and Chrysler Buildings; the World Trade Center in memoriam; the Guggenheim Museum; and a hot dog cart that's half the size of the nearby hot dog. Underneath is the Brooklyn Bridge and a street crowded with a police car, a fire truck, a couple of taxi cabs and a tour bus. 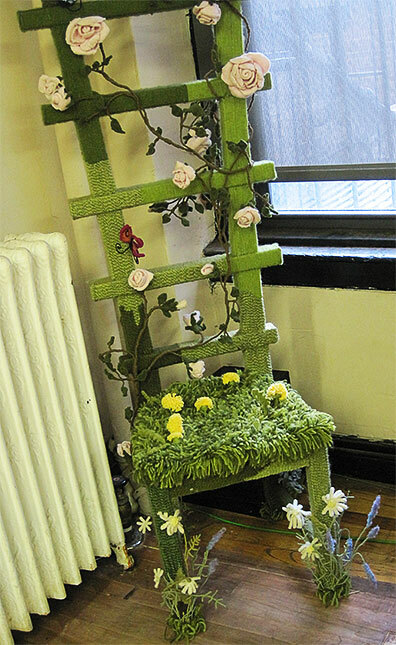 In the same room, there's also a chair/trellis hybrid crawling with butterflies and summer flowers. I was trying to come up with a "country seat" joke here, but it wouldn't gel. This is a box of something. I don't know what's in it. I was afraid to lift the lid. 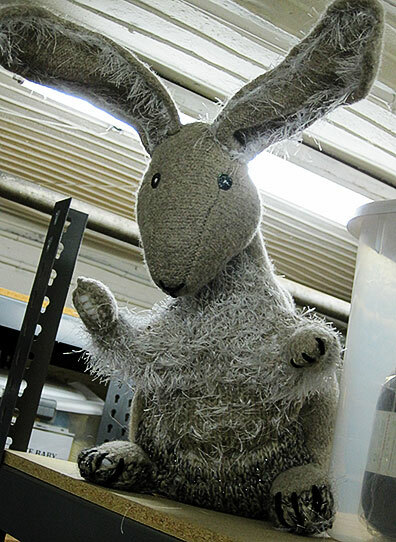 Down in the basement, among the yarn storage bins, a friendly bunny keeps the staff company while they sort stock. 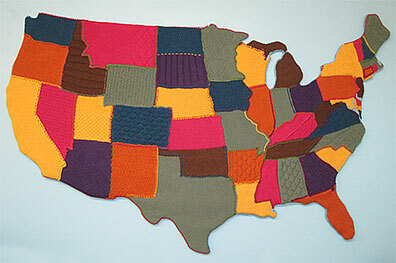 A wall map, about five feet across reminds one that there aren't Red States or Blue States, only states that like to play with yarn. Kind of a nice thing to remember as the political candidates try to convince us otherwise. I'm so happy I remembered to get my hair did. Also, I have a boycrush on Patty Lyons, the maven/doyenne/manager/queen of the LB Studio. She arranged the whole splendid shindig with such mastery that when she told me to stop fussing and relax, I actually did. It was fun. I woke up. I hated to leave. I can't wait to go back. Hint, hint. 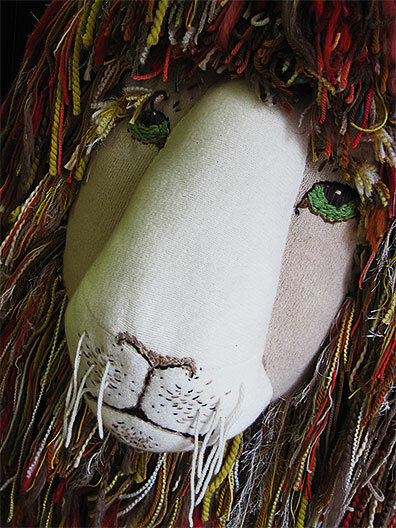 After that fun and fascinating glimpse into the business behind the brand, I will forever look at Lion Brand yarn with much more fondness! You should have seen what got cut out of the video! What can I say, Franklin brings out the naughty in a gal! I am so glad I lived in NYC when I was young and poor and when Hell's Kitchens was still hellish. I have that same excitement when I go back. (Flying in is fine, but I love going in through the Lincoln Tunnel--first the view of the city, then the long, anticipatory trip through, and then, boom, you emerge into IT!) 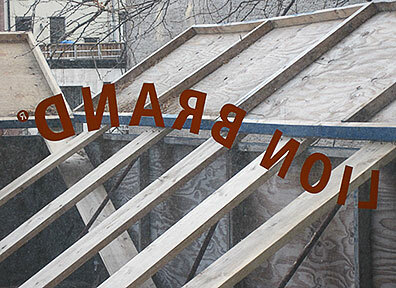 Can't wait to check out BL Studio on my next trip. It sounds fantastic. 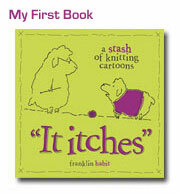 find it hard to believe no one commented about your new book! SQUEEEEEEEE! What an Amazing Displays!!! Love it! !....New Book??? OMGosh! I have never been a city gal (much to the chagrin of my SO), but I'd go to see that studio in person! Thanks for the tour! Franklin is a good teacher, organized, with clear explanation and demonstrations. Take a class if you ever get the chance. We were educated and inspired. And next time you're in the city, venture across the Hudson to the LB outlet to see more incredible displays. Just a guess, but I think the box is actually "The Monster Book of Monsters" from the Harry Potter series. The box is the creation of one of our former employees, Gina. It's name is "Muncher", and he was created when I made the simple request "make a ballot box" for a window contest we were running, and that's what I was handed! Now Muncher is the box for class evaluation forms. I was in your photography class, and enjoyed it immensely! Not only was it very informative, you are a charming teacher! @Patty, thanks for clarifying that! Thanks for the tour! That was fun. You have just coined my favoritest phrase about this place ever in this: "I go to New York to plug in. I love the way it wakes me up, even when it's unpleasant. Take, for insance, the smell of the subway underpass at 42nd Street. I'm not saying I savor that aroma, but you must admit it cannot be taken casually." Yes! My first six months living in New York, I was lost and upset. After that, I realized that there's just no place that forces you to be so immersed in the gritty reality of living. There's a reason so much art is created here. 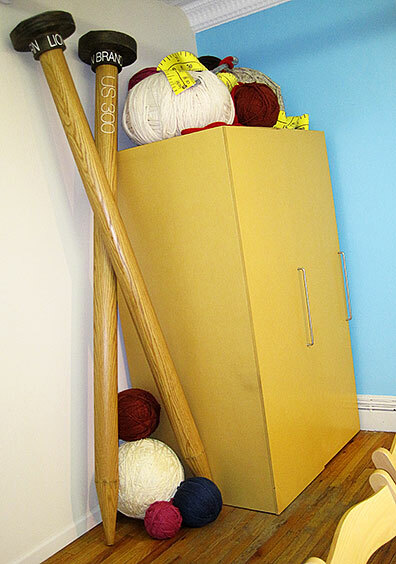 Psst, I'm in your class at Vogue Knitting, yay, cannot wait! Many long years have passed since I lived in New York - thanks for the memories. Grimy, gritty and surreal it may be, but there's nothing on earth like its energy and fizz. 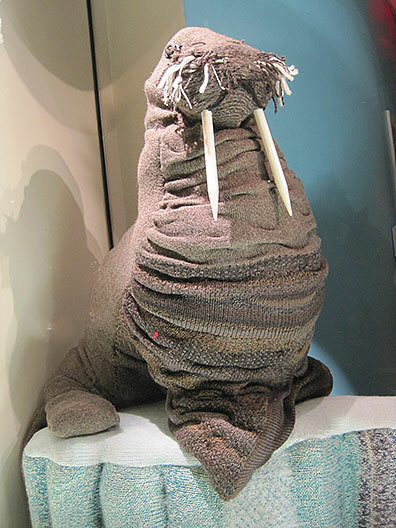 By the way, is it very wrong of me to want to knit a walrus? would love the pattern for the suicidal jumper. Thank you for calling him (her?) an Inuit. That studio looks awesome, need to visit it one day. Patty is simply the best, isn't she? I love her a lot. She and all the staff are amazingly warm and friendly and funny. I just love it there. I really want to go back to explore some more. Spolia. Sigh. I love that word. Also, my sister has been complaining for *years* that I walk too fast. Go figure. Anyway, glad you enjoyed your time in NY, and I can't wait to see you again in Philadelphia! It sounds like a great trip. I've been to NY a couple of times (and enjoy it immensely despite my love of quiet), but I've only made to Habu, Schoolhouse and Purl Soho. I'll have to try to make it to Lion Brand next time! 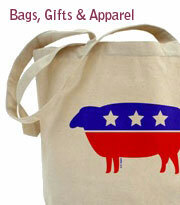 PA is a red state; they got it right (heh heh heh; see what I did there?) much to my dismay, I might add. OMG, there are so many things to play with at LBS! 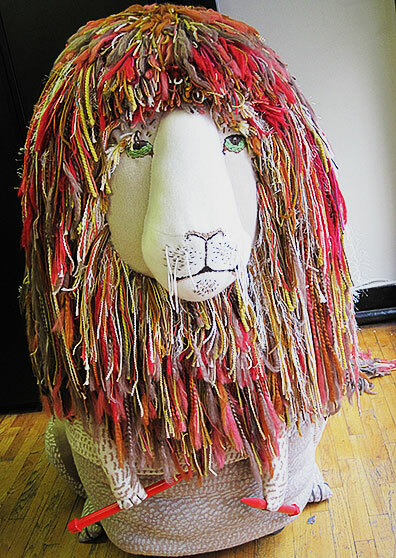 Lion Brand studio is such a wonderful place to hang out. The staff is amazingly helpful and nice, and the space is--well your pix say it all. I feel like I've come to a great party every time I go there, where even if I don't know anyone, I end up having good conversations, squeezing lovely yarn, and admiring the cool art. I loved your photography class--I wish it was an hour longer! I have the best time in your classes, they are always interesting, I always learn something, I have such a good time, and laugh so much, I hate to leave. Franklin, New York wants you to stay! they do have nice window displays. cant we call the fisher with the walrus an inupiat? you know, the inuit which live in alaska/the US? Are ANY of the patterns of the great items in this great post available? 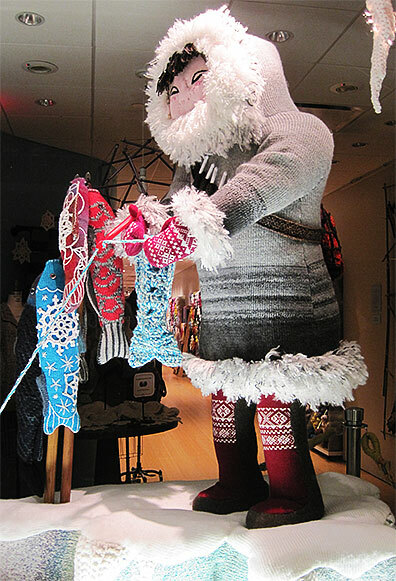 I would LOVE to knit the fish! What gorgeous images - specially love the lion and the walrus! You are on honorary NY'er. Your talk was so funny, I needed my (vintage) handkerchief. Love the photos of the NYC postcard -- that was in the window in late summer, I believe, and I tried to take photos through the glass ... your are, of course, much much better! I must not be a real American because I love New York and the hustle and bustle. I live in the NYC burbs, but have yet to make it to LBY Studio, so thanks for the virtual visit. I'm looking forward to my first trip there for a class in January! Lion Brand Studio looks amazing! If I ever go to NY I am for sure spending most of my time there. Wow - that's brilliant. Thanks for taking us on a tour. Now I want to plan my own trip. I love NYC too, but am not supposed to as I am from Minnesota. What a flippin' adorable studio! 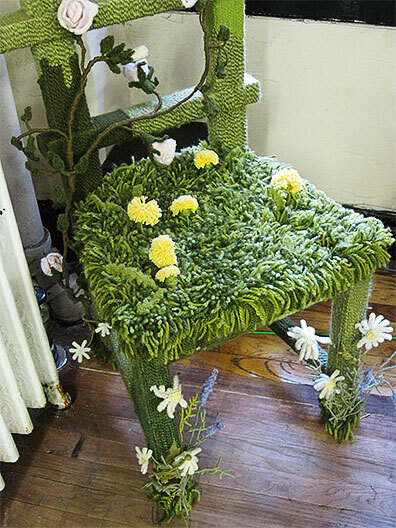 I love love love that trellis/chair thing and kind of want to make my own! for the record though, just because someone doesn't dig the city life, doesn't mean that he/she is happy in the suburbs. I hate the suburbs, but also do not like living in the city. Give me thirty acres, a barn, space to hunt and no neighbors in sight, please :) When city folk judge/stereotype non-city folk, it makes it easier to for us to do the same. Will definitely catch you next month at VKL. Email me and we'll do dinner or something, yes please? PS: Sounds like you just need to up and move here already! WOW! Your posting has changed my opinion of Lion Brand forever (for the better, of course). What a neat place to investigate when we get up to New York. I live in Topeka, KS. When I used to teach in a neighboring county there were plenty of parents who would not allow their HS-age offspring to go into town after dark- too dangerous. So I'm going "They live in Chicago! There's a big difference between Chicago danger and New York danger?" Well, live and learn. I bet you can get mugged in Chicago if you know where to go. Patty is basically the best, isn't she? I really like her a lot. She and all employees are incredibly heated and helpful and humorous. I just really like it there. I really want to go returning to discover some more. Keyifli güzel bir sohbet için lütfen sohbetodam.org web sitemi de ziyaret edin. Her zaman klima servisi konusunda uzman kadro ile birlikte çalışan korkmaz klima servisi siz değerli müşterilerine kadıköy klima servisi hizmeti vermektedir.